Hot plate coming through!! 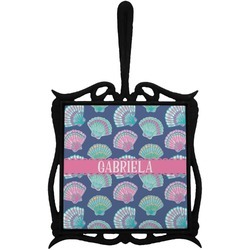 You'll want our personalized trivets to transport your hot pots and pans from stove to the dinner table in style. They can nicely accent your kitchen decor and protect your tables and countertops from heat. With colors and patterns galore you are sure to find one that tickles your fancy. 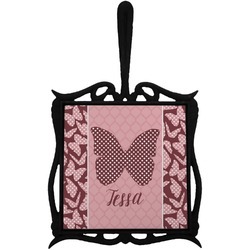 You can even give them as wedding or housewarming gifts. The trivets are made of sturdy wrought iron and have a heat resistant, removable tile in the center which is super easy to clean. The handle helps you carry your hot pots and the rubber pads on the bottom make sure that heat doesn't ruin whatever surface it is sitting on.